This past summer I made a Halloween themed Donut quilt top. I made the throw size which will be perfect for snuggling on the couch this fall! My plan is to free-motion quilt this using a bat design. I realize Halloween is just around the corner but maybe I can get it done! The quilt pattern is by Johanna Masko and is called Donuts. I just love it! It’s simple, straightforward and fun! I’ve recently discovered the value of quilt patterns. With a pattern, compared to just pulling some fabric and chopping it up, you know exactly what you are getting into. Isn’t that nice? No more wailing at the end of a project when you realize you needed just a quarter more of a certain print or the dreaded “slump” that comes along with not knowing if a quilt top is done or not. Sometimes when I’m working on a project I want to know there is an end! I’m not saying I don’t love a good scraptastic “who knows where this is going” quilt project but those can make my brain hurt just a bit. What you do like? Patterns or just winging it? Something in between? I will be posting finished quilt pics of my Halloween Donut quilt SOON! This entry was posted in in progress on October 7, 2013 by susannah kate. Here is my Cascades quilt top. This is the second quilt I’ve made using this pattern and I love how it turned out. 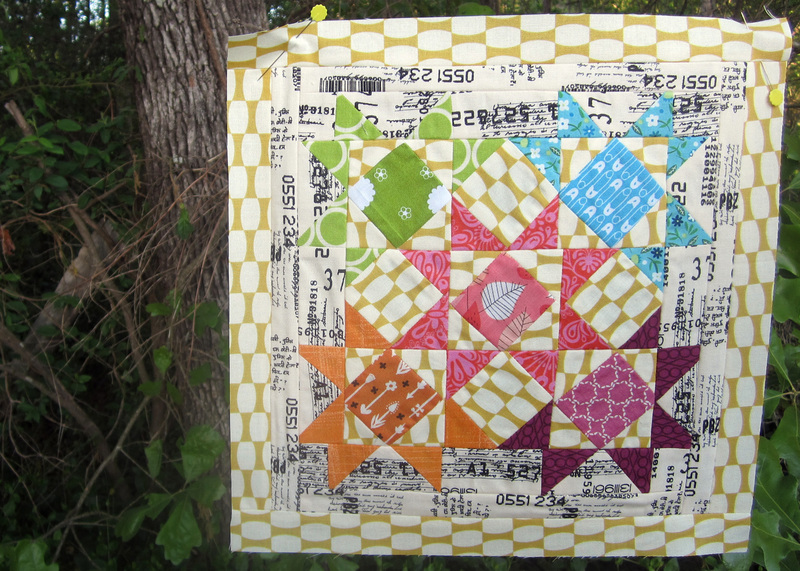 The fabric is Flea Market Fancy by Denyse Schmidt and the background is Kona in ‘Natural’. It takes 10 fat quarters and 2 yards of background fabric to make this gem. There is very little waste which I adore. Plans are in the works for a third Cascades quilt and maybe, just maybe, I will dip into my super special stash for this next one! This entry was posted in in progress on September 17, 2013 by susannah kate. 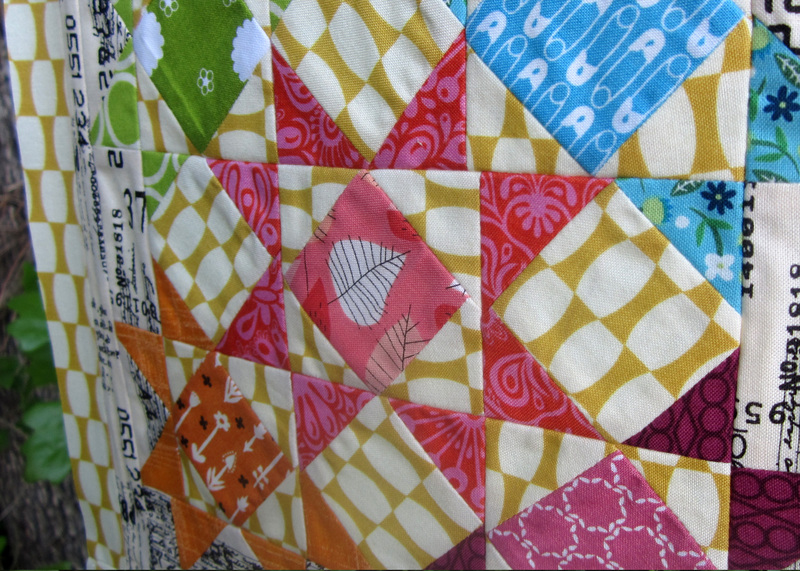 I’m really very excited to be included in the Drunkard’s Medallion-along, a modern quilting bee with 6 great gals I met at Sew South. This past month we made our quilt centers and I’ve already mailed mine off to the next girl in line! My original ‘theme’ was Amelie. The movie is just so beautiful and I hoped to capture some of that in my quilt. I couldn’t figure out how to interpret the movie into a quilt block so I just went with scrappy and colorful. I do hope some of the girls still try to include elements of Amelie for me! This is just the beginning and I can’t wait to share more! 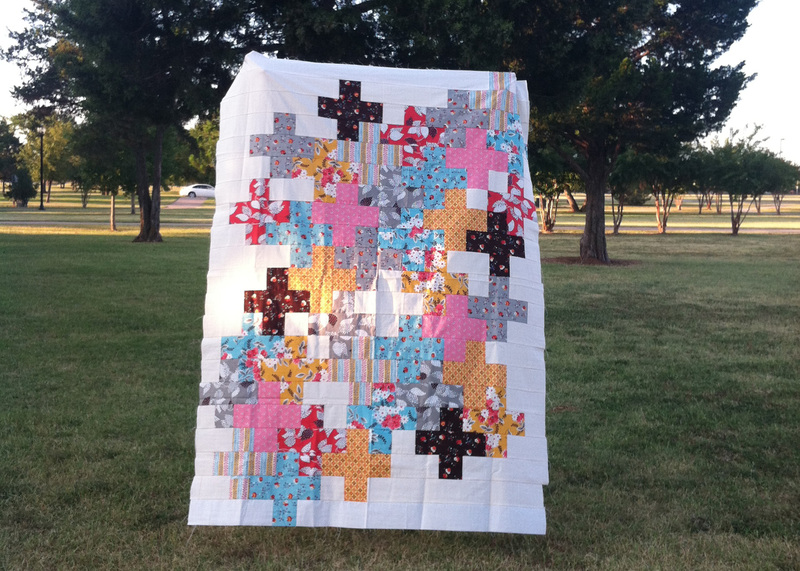 This entry was posted in in progress and tagged The Quilting Bee on April 28, 2013 by susannah kate.